Mission Statement: To provide creative and entertaining collaborative content for the internet firearms enthusiast. Above all the spirit of enthusiasm surrounding firearms and related topics is the driving factor and The Kommando Blog seeks to provide some of that enthusiasm on a more directed and curated platform by providing a space for contributors to share knowledge and amusement. Content may be shared or derived from various sources but the purpose of the blog is to provide fresh and new content. The Kommando Blog must stand on its own. Contributors are encouraged to seek topics or projects that are under represented or unique in order to provide the audience the opportunity to consume content they will not find anywhere else. The Kommando Blog will be honest and forthcoming. The circumstances of any product or service that gets discussed will be open as will any advertising arrangements, sponsors, endorsements etc. Kommando blog will not unreasonably turn away support from a business, org, or individual who wishes to help promote, support, or even contribute to the blog but the nature of all such relationships will be public knowledge. Any communication directly on behalf of the blog will come from officially recognized channels. Staff will not post anonymously or communicate in disingenuous fashion on behalf of the blog (i.e. cross posting to a forum under the guise of a user unrelated to the blog). Contributors should be in it for the benefit of the audience first and foremost. The goal of the blog is to provide an entertaining combination of knowledge and humor. “In jokes” and the like are acceptable but not at the cost of legitimately decrying anyone or anything in an irrational manner. There will always be a voice for criticism but The Kommando Blog should not be a platform for personal attacks. The Kommando Blog is fair and accepting. 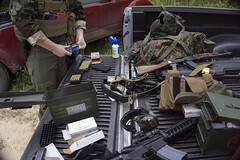 Contributors, participants, and readers are united in a common love of firearms, related topics, and fun. We are not here to discriminate or put down a group or population. The Kommando Blog will not be a space where people complain about being negatively generalized as gun toting nut jobs and then turn around to generalize others. The Kommando Blog is not an open political blog. Any commentary on law or politics should be limited to the impact or implications of firearms related law and nothing more.